Olympic Arms Closing After 40 Years! You are here: Home / Firearms / Olympic Arms Closing After 40 Years! Olympic Arms of Olympia, Washington announced just after SHOT Show the company will be closing their business on February 28, 2017. After more than 40 years in the firearms business, the Schuetz family who owned and operated Olympic Arms has decided to leave the firearms market. The end of a firearms company is a part of the open market system, but is often a tragic event in our opinion. The robust American firearms market provides consumers the most abundant choices in the world, and is the driver in world-wide competition and innovation. Olympic Arms was not one of the major U.S. firearms manufacturers, but their contributions helped drive the hunting AR-15 market. After more than 40 years of business, it is with great sorrow that we announce that February 28th, 2017 will be the last day of operation for Olympic Arms, Inc. The Schuetz family would like to express their heartfelt thanks to all their friends, associates, and partners that have been a part of the Olympic Arms experience. Most of all we would like to thank our loyal customers and patrons who have been with us all this time. No refunds or returns will be accepted after 1-25-2017. On-line Shopping Cart will be active and effective while supplies last. All Warranty service ceases 1-25-2017. Warranty work and repairs currently in-house will be serviced and returned. New orders will only be taken for inventory currently in stock, or that can be built from remaining inventory. All inventory will be liquidated. Olympic Arms UMAR rifles are offered in .22-250 and .300 OSSM. Olympic Arms was best known for quality hunting AR-15 options, but also provided a smaller general AR-15 offering as well. The great thing about Olympic Arms was their willingness early on to expand the AR-15 design into a broader caliber range than the traditional 5.56mm/.223 cal. chambering. The Olympic Arms WSSM series provided short magnum rounds to hunters, while their OSSM models combined a .300 short magnum cartridge in partnership with Hornady, and a very well-respected .22-250 version as well. 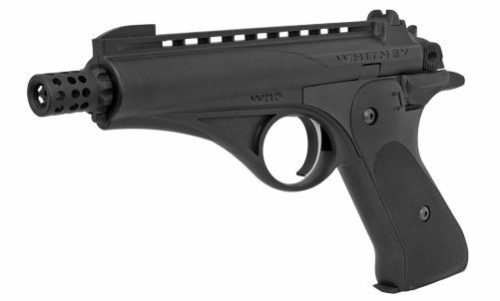 The Olympic Arms Whitney Wolverine pistol. Less known, was the fact Olympic Arms offered customized Model 1911 pistols and their own Whitney Wolverine pistol as well. The Whitney Wolverine had a futuristic laser blaster profile, that looked to be fun to shoot and comfortable to grasp. Olympic Arms Gamestalker offered .243, WSSM, .25 WSSM, and .300 OSSM. Unfortunately, Olympic Arms never seemed to pick up on the huge demand for Modern Sporting Rifles (MSR) for home defense, law enforcement, or shooting competitions. Though not mentioned in the press release, it is quite possible that lack of diversification led to the downfall of the company. The AR-15 continues to be one of the most popular firearms in modern America, but the popularity is felt much greater in more “tactical” versions. Despite this error in foresight, I for one am sad to see a 40-year old firearm company go under. Aaron is a sergeant with a midwestern police department, where he serves as a trainer, supervisor and SWAT sniper. In addition to his broad tactical knowledge, Aaron has experience in DUI, DRE and undercover narcotics investigations.